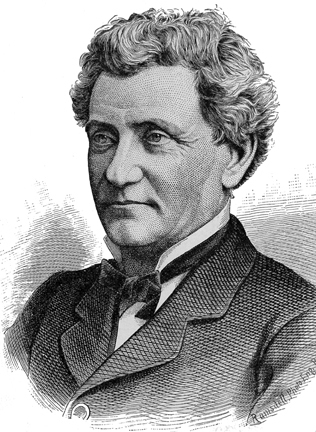 Rochester, New York horticulturist James Vick (1818-1882) owned a successful seed company in the late nineteenth century. His mail order business included customers from around the world. Vick published a monthly garden magazine Vick’s Illustrated Monthly. He offered various kinds of advice in the magazine. “and they sometimes manage to find a few small ones that their friends have not noticed but never discover those large blots that are disagreeably apparent to everybody but themselves. “So they conclude, being so nearly perfect, certainly so much more so than their neighbors, that it is hardly necessary to trouble themselves about a change, while, of course, anything like reformation is out of the question. Newport mansions feature Christmas poinsettias. Everyone knows that Newport, Rhode Island is home to the east coast grand mansions of America’s Gilded Age. Right now four of the mansions have taken on a festive holiday look. Until January 1 you can visit these four Newport mansions, The Breakers, The Elms, Rosecliff, and Marble House, decked out in lights and the holiday colors of red, green, and gold. The Preservation Society of Newport County, the group that oversees eleven historical properties in Newport, has made this holiday display at the mansions available to visitors for more than twenty-five years. Decorated Christmas trees dot the rooms of the mansions. The trees sometimes surprise you when you turn a corner and see a tall evergreen decked in gold and red as in the Gothic Room of Marble House. The dining room tables are set with period silver and china, and individual white candles illuminate the windows. Christmas wreaths and evergreens decorate walls. 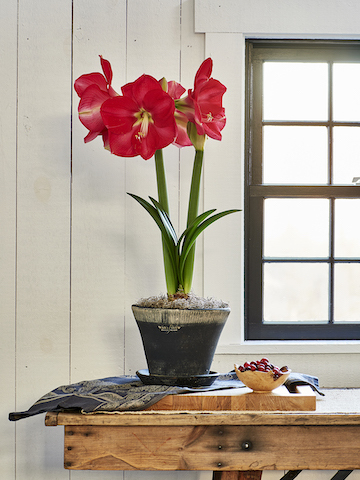 are removed and replaced several times during the holiday season to ensure the displays remain fresh. 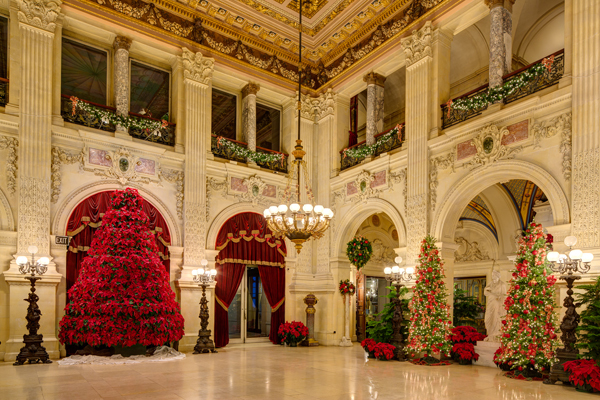 The poinsettias at The Breakers provide a stunning show of the season’s colors. Architect Richard Morris Hunt designed The Breakers, a 70-room Italian Renaissance-style palazzo, built in 1895, for Cornelius Vanderbilt II, President and Chairman of the New York Central Railroad. Its interior includes rich marble, mosaic tile floors and ceilings, and open-air terraces with magnificent ocean views. Right now in the Grand Hall of The Breakers stands a 15-foot tree made of red poinsettias. 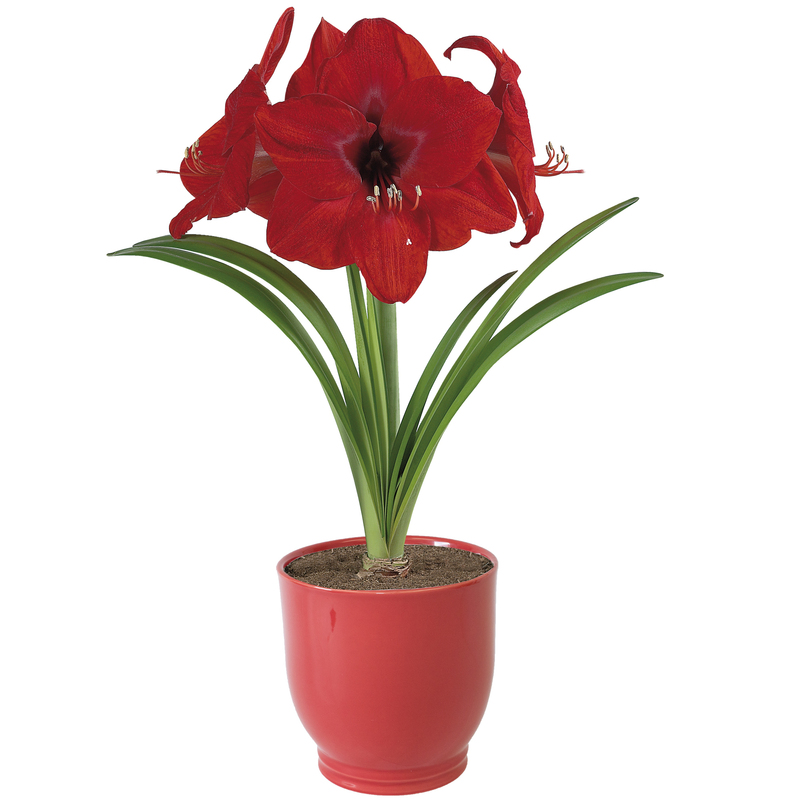 The room with its walls of yellow stone and a 50-foot high ceiling that seems to go up forever shines with the red color of the poinsettia. When The Breakers was built, the poinsettia, originally from Mexico, was beginning its journey as the holidays’ most popular decorative plant. Philadelphia nurseryman Thomas Meehan included an article about the poinsettia in his magazine Gardener’s Monthly in May of 1876. And that is truly what you find at The Breakers. The blossoms of the poinsettias brighten up this mansion and three others in a holiday spirit. 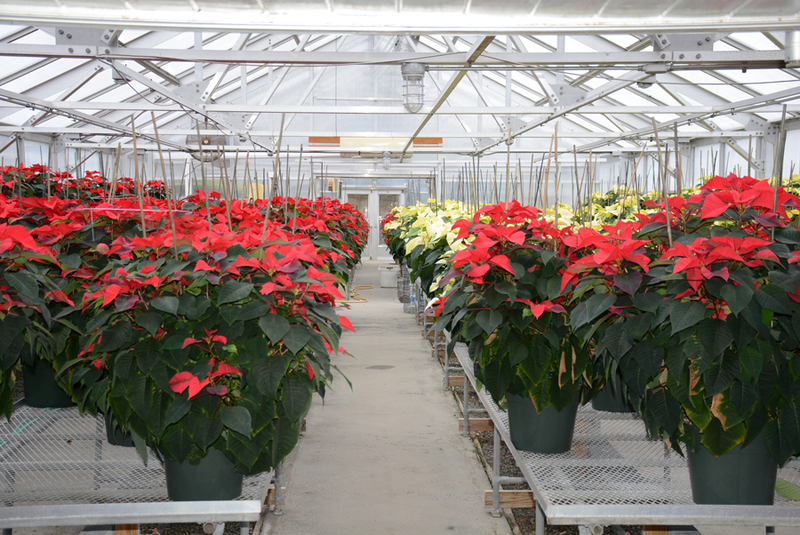 A few days ago I visited the University of New Hampshire’s Poinsettia Open House in Durham. This is an annual three-day event held after Thanksgiving. 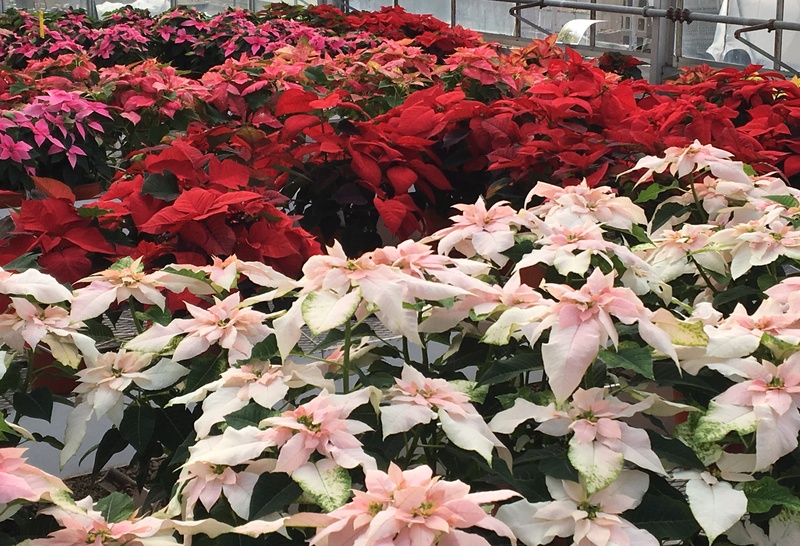 Colorful holiday poinsettias lined the metal shelves in the greenhouse at UNH a few days ago. While there, I found out that UNH’s horticulture degree program will end May 30, 2019. I was sorry to hear that news. Over the years I have visited UNH’s greenhouses various times for many events they sponsor like the Poinsettia Open House. Also, part of my training as a Master Gardener took place in the very same UNH greenhouses. UNH’s Thompson School of Applied Science will continue to offer two-year associates’ degrees. They include Veterinary Technology, Forest Technology, and in an Applied Animal Science program emphasizing livestock animals. The Thompson School however will no longer offer degrees in Civil Technology, Culinary Arts and Nutrition, Horticultural Technology, or Integrated Agriculture Management. UNH leadership explains its decision in this way. There is increased competition in availability and price for two-year associates’ degrees, fewer students in the applicant pool, and a significant increase nationally for short-term credentials. All of this has led to decreasing enrollment and offerings not in line with state and regional workforce needs. I know this was a hard decision for the University to make. Many people have signed a petition to reinstate the Horticultural Technology program. Not sure that will help, but I would sign it in a heart beat. We need more programs in Horticulture, not fewer. The north shore Massachusetts town of Ipswich claims more First Period houses than any other community in America. First Period refers to those houses built between 1625 and 1725. 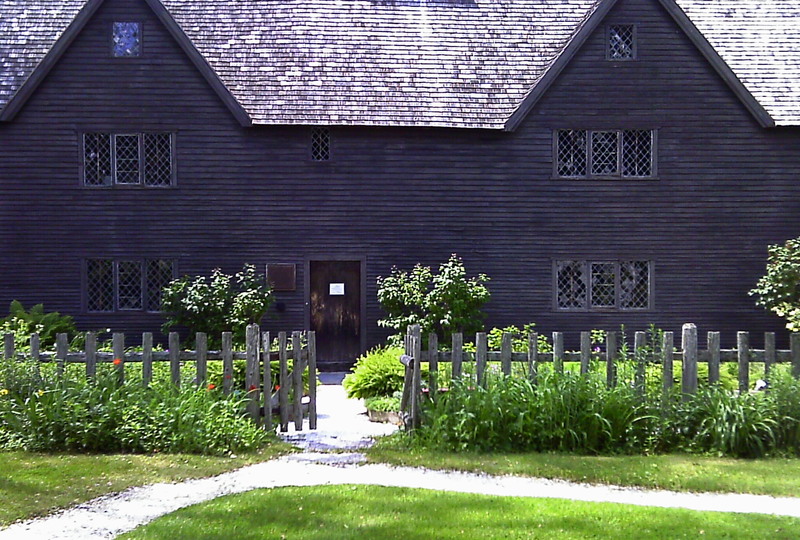 The style of the Whipple House, built in 1677, represents that period. At the end of the nineteenth century the Whipple House was moved to its current location in Ipswich. Though it had suffered much disrepair over the years, several historically minded citizens of the time thought it worth saving. In its day the Whipple House was the grandest of examples of early American homes. At the end of the nineteenth century the Reverend Thomas Franklin Waters became a leading member of the Historical Preservation group in Ipswich. An extensive kitchen garden at the front of the house greets a visitor to the Whipple house. 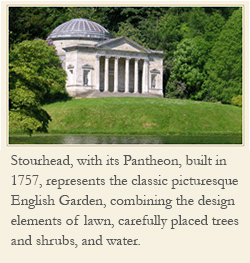 The location and design of the kitchen garden continues the English garden tradition of early Plimouth Plantation as well. In the early 1960s garden historian Isadore Smith (AKA Ann Leighton) and landscape architect Arthur Shurcliff designed and installed the raised beds of the kitchen garden. Smith and Shurcliff set out to recreate what would have been a typical wife’s kitchen garden of the seventeenth century. They designed a garden with mostly herbs since the wife was responsible for both the food and the medical needs of the family. 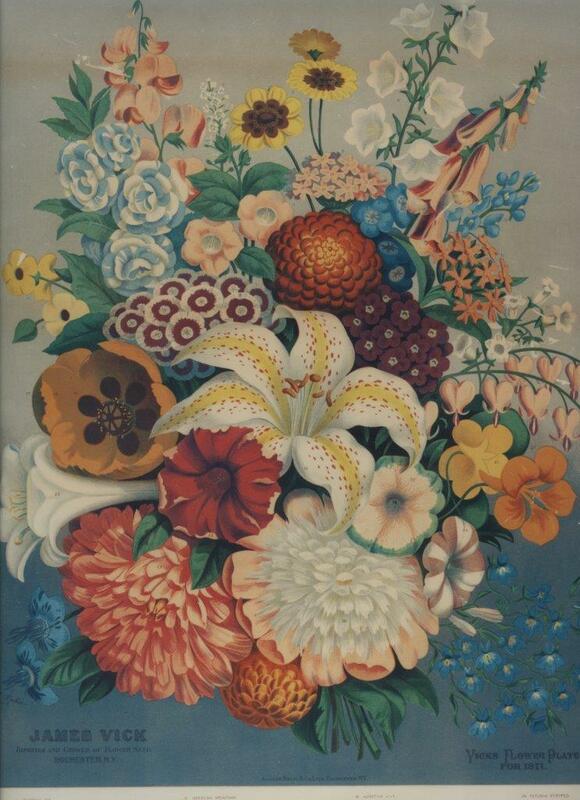 There was not much time for a pleasure garden of decorative flowers so the plant choices of the kitchen garden were based on the cooking and health needs of the family. The English style of an enclosed kitchen garden with raised beds lined up in a certain symmetry was also the style at the restored gardens of Colonial Williamsburg. Mr. Shurcliff provides a link between the Whipple House and the Williamsburg garden restoration. In the 1930s Boston landscape architect Shurcliff, who previously had worked with American landscape pioneer Frederick Law Olmsted, also recreated the garden of the Governor’s Palace at Williamsburg. 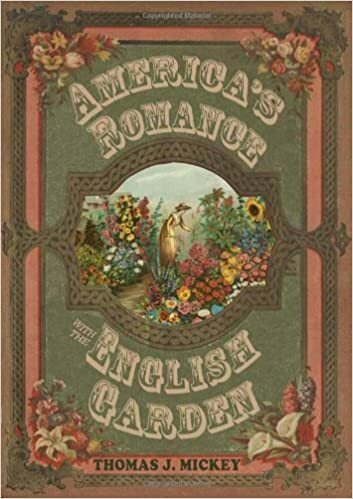 According to landscape architect and garden writer Rudi Favretti, the Whipple garden style, centered on the practical needs for plants, continued as the predominant form of gardening well into mid-nineteenth century America. Thus today the Whipple House illustrates the early influence of English garden design on American home landscape.